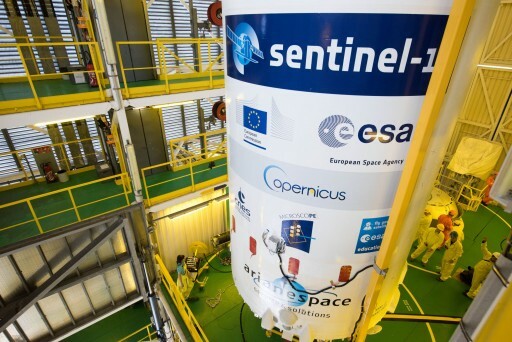 Update: The Launch of a Soyuz rocket carrying the Sentinel-1B radar satellite for Europe’s Copernicus Program along with four secondary payloads has been delayed until Sunday. Teams backed out of the countdown on Saturday prior to tanking the 46-meter tall rocket due to strong Upper Level Winds, not permitting Soyuz to safely ascend out of the atmosphere. The next launch attempt is planned at 21:02:13 UTC on Sunday, though winds aloft will continue to be assessed over the next 24 hours. 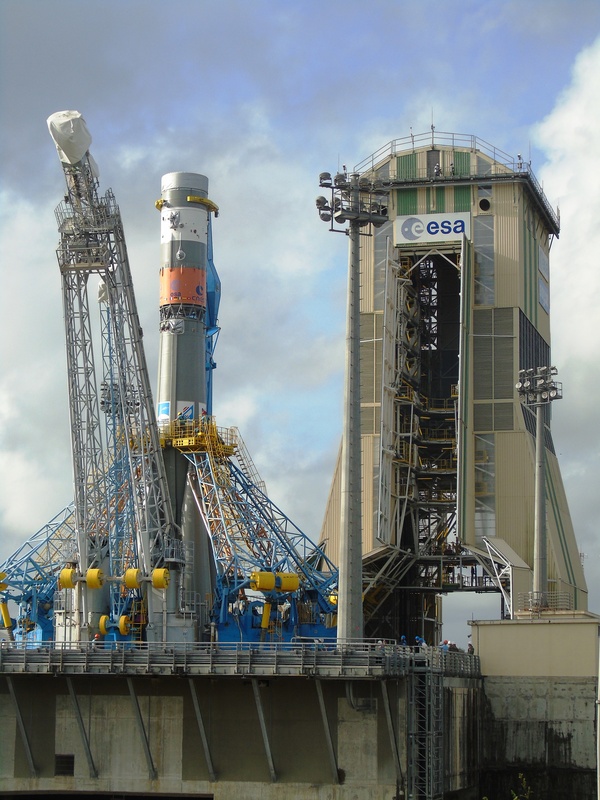 The launch of Europe’s Sentinel-1B satellite atop a Russian-built Soyuz rocket was delayed on Friday due to poor weather at the ELS Launch Site of the Guiana Space Center. A new launch attempt will be made on Saturday with conditions appearing slightly more favorable to get the vehicle off the ground to begin a complex multi-orbit mission. Setting up for a launch attempt on Friday, teams initiated Soyuz countdown operations around eight hours prior to the expected 21:02 UTC liftoff time. Over the early portion of the countdown, teams installed batteries on the Soyuz and closed out the vehicle and launch facility for propellant loading. The 2,164-Kilogram Sentinel-1B satellite was activated at around L-7 hours and the Mission Control Team at the European Space Operations Center in Germany began monitoring telemetry from the spacecraft while also going through communication checks with all ground stations called up for the mission. Approaching the L-4-hour mark, the Russian State Commission – also overseeing Soyuz launches from the overseas launch site – convened for the final pre-launch review, looking at the results of launch vehicle testing, the status of the countdown and the expected weather conditions. Weather had not been looking particularly favorable throughout the day with occasional thunderstorms rolling over the ELS Launch Site. Weather forecasters expected thunderstorms to persist through the 18:02 (local) launch time and the State Commission decided to stop the day’s attempt prior to propellant loading. With the delay called, Soyuz gets to stay on the ground for at least another day – the next launch opportunity is available on Saturday, also with a instantaneous 21:02:13 UTC launch window. The weather pattern at the Guiana Space Center will remain in place throughout the weekend and into next week with thunderstorms starting in the morning hours and lingering into the afternoon and evening hours. However, the forecast for Saturday and Sunday shows a slightly higher chance for thunderstorms subsiding around mid-day which would permit a launch attempt to be made in the afternoon. Starting the new week, thunderstorm risk throughout the day increases again, making a weekend attempt the best opportunity for getting the VS14 mission off the ground. 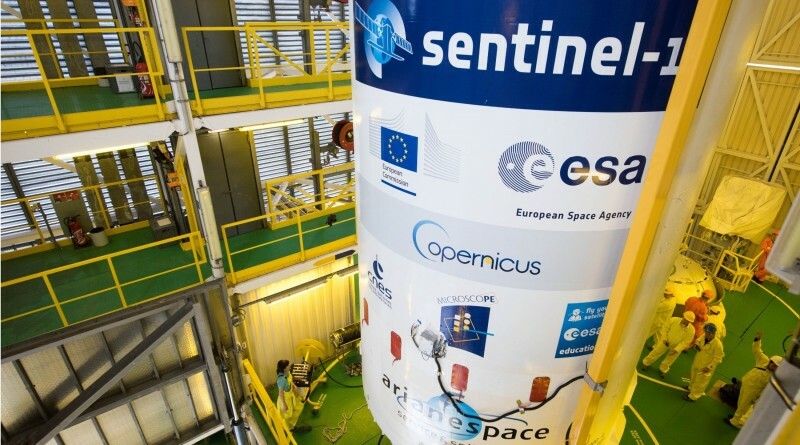 Tucked into the ST-type payload fairing, Sentinel-1B follows in the footsteps of its twin, launched two years ago to kick off the deployment of Europe’s Copernicus satellite fleet. 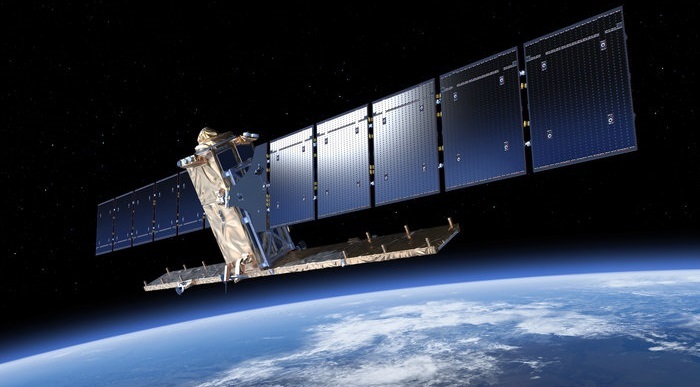 The Copernicus Program’s global surveys will be used by policy-makers, maritime operators, scientists, meteorologists and resource managers. 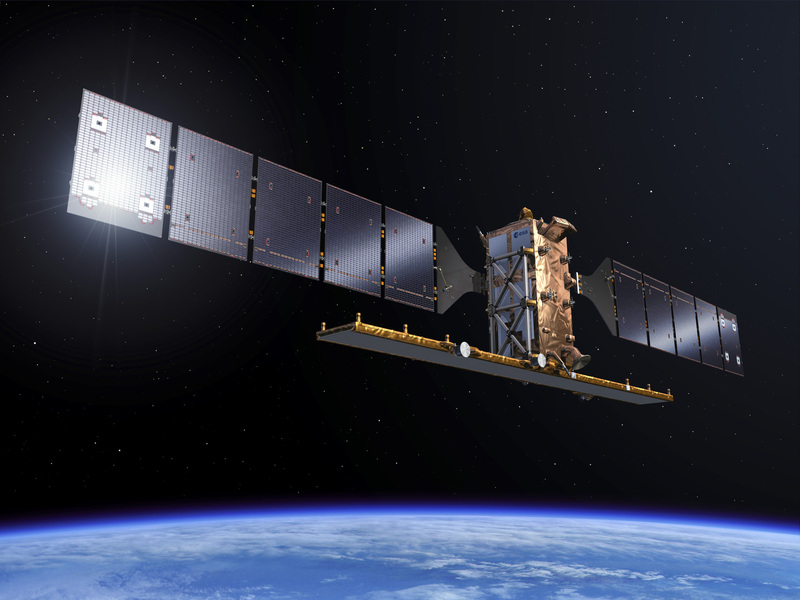 Taking the pulse of an ever-changing Earth, the Copernicus satellite constellation is expected to finish deployment by 2020. Built by Thales Alenia Space, the Sentinel-1 spacecraft sport a 12-meter long radar antenna that deploys after launch and bounces 5.4-GHz radio pulses off the ground and records the reflected signal to extract information on ground geometry and properties. With 280 active phase centers, the 945-Kilogram C-SAR payload consumes nearly 5,000 Watts of power and collects hundreds of measurements per second using different operational modes to either cover a large area on the ground or achieve high image resolutions. The VS14 mission will involve a complex orbital ballet of the Soyuz launch vehicle, specifically the Fregat upper stage that will assume control of the flight after a standard nine-minute Soyuz ascent mission. 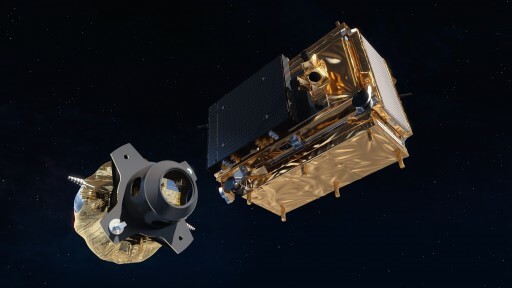 Fregat will be tasked with a total of five main engine firings to target three different orbits for the release of the Sentinel-1B radar satellite, the French MicroSCOPE physics research satellite and three university CubeSats. Sentinel-1B is set for separation into a 686-Kilometer orbit 23 and a half minutes after launch, marking the start of a three-day critical sequence controlled from the European Space Operations Center in Germany to test and reconfigure the satellite for operations in orbit. When the primary payload is on its way, Fregat will dedicate the rest of its propellant to a secondary mission of deploying four satellites. Two hours into the flight, Fregat will ignite for just 13 seconds for an orbit-lowering maneuver, aiming for an orbit of 453 by 665 Kilometers for the release of the three CubeSat payloads. Packed into a single container are three 10 x 10 x 10-centimeter satellites from European universities, launching as part of the European Space Agency’s Fly Your Satellite initiative. The three CubeSats will be sent on their way at the same time, two hours and 48 minutes after liftoff followed by the separation of the ASAP-S payload platform. Next will be a pair of engine firings, the first 12 seconds in duration at T+3 hours and 32 minutes and the second lasting 16 seconds at T+3 hours and 57 minutes, to raise the orbit to 711 Kilometers for the deployment of the 303-Kilogram MicroSCOPE satellite.